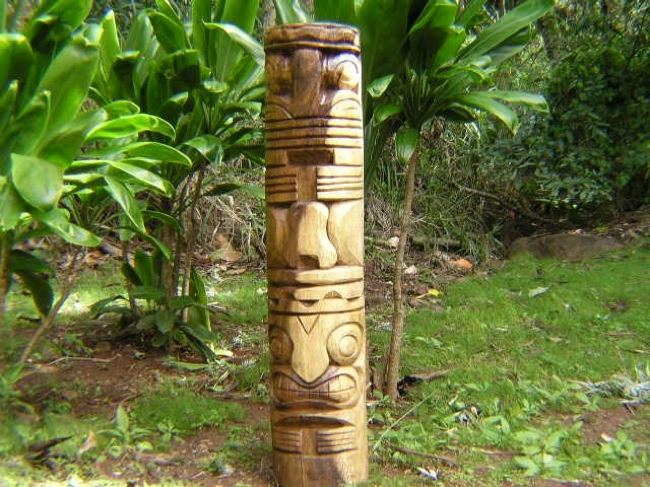 Here is a unique hand carved Tahitian Tiki totem depicting 2 deities. This Tiki totem has also a double meaning love and prosperity which can be distinguised by the set of eyes going upward and downward. This Tiki pole measures 48 inches tall and 9 inches thick and weighs over 120 lbs. The totem has been hand rubbed and finished with oil to give a smooth finish. Made of premium Acacia wood natural color. - INDOOR/OUTDOOR USE!